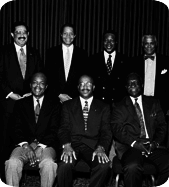 Nine African American accountants in the New York area founded the National Association of Black Accountants, Inc. (NABA) in December 1969. Their goal was to establish a national organization that dealt forthrightly and effectively with the many common problems faced by the growing number of African American accounting professionals. Since the founding of NABA, the membership has grown to approximately 5,000 members in over 140 active professional and student chapters in major urban areas and at universities across the nation. NABA’s primary purpose is to encourage greater participation by African Americans and other minorities in the accounting profession. Today, NABA, Inc. - Detroit Chapter is one of the largest professional minority business organizations in the state of Michigan. Our primary goal is to encourage and increase the percentage of minorities to pursue academic studies and professional careers in accounting and finance. We are part of the Central Region Chapter of the NABA. The Central Region contains 14 chapters and Detroit is one of the largest chapters in the region, second to Chicago. We currently have over 50 professional members. Our membership profile consists of CPA’s, CISA’s, attorneys, financial advisors and many other non-CPA professionals in public and private industries, including healthcare, automotive, Big 4 and local accounting firms. There are presently over five student chapters located at colleges and universities across Michigan. Click here to learn more about NABA’s Central Region Chapter. What does the Detroit Chapter offer? We offer a variety of educational and professional development programs for our student and professional members in the accounting and finance professions. From hosting CPE technical sessions and accounting awareness seminars to providing national and local scholarships to students, we team up with our corporate partners to provide our members with opportunities to develop and maintain rewarding careers in accounting and finance. How do I join the Detroit Chapter? Interested in joining one of the greatest business organizations in the country? It’s simple! You can join the Detroit Chapter of NABA by visiting the National Office Website at www.nabainc.org. You can complete the online application or print and mail in your application. Just list "Detroit" as your "Chapter Affiliation" on your membership application. Visit the Contact Us page of this site to be added to the e-mail distribution list.